During the nineteenth century, in seaports along the China coast, … it was not a good idea for a Chinese man then to walk alone along the waterfront, especially after dark. “To be Shanghaied” entered the English language to signify the kidnapping that occurred, not for service at sea—unless it were pirates desperate for additional crew—but for labor ashore. A ship would simply be the vehicle bearing the victim to his new life. He would be headed for some overseas destination, sometimes Singapore, as a contract laborer, and a virtual slave in many cases. Customarily brokers would not resort to kidnapping. Instead they would advance a variety of approaches to their quarry: cajolery and threats. Crimps would receive a bounty for every victim delivered to a holding pen, the so-called barracoon, a word taken directly from the African slave trade. The Chinese shipped all the way across the Pacific received treatment as bad as Africans in the Atlantic Middle Passage. Many would die at sea…. In the barracoon, the man would be given a cursory physical examination and if passed, which was highly likely, he would be handed a contract to sign specifying the number of years he must work and the amount of pay he would receive. A governor of Hong Kong, Sir John Bowring, saw this process for himself: “hundreds of them gathered together in barracoons, stripped naked, and stamped or painted with the letter C (Cuba), P (Peru), or S (Sandwich Islands–Hawai’i) on their breasts .” They would be held there until a ship was ready for them. Some did escape from the barracoon, Bowring said, “by going through an opening in the water closet into the mud and water of the river,” which might mean survival—for those who could swim. Driven by poverty, many Chinese also left the mother country voluntarily. The 1849 gold rush in California encouraged those looking for a new life promising prosperity. The mines and plantations of Southeast Asia beckoned others. Treatment of those bound for Singapore was marginally better than those heading for forced labor elsewhere. Their numbers were heavily male; the few females who came, often kidnapped or deceived, were mostly prostitutes whose services an all-male society craved. From the China coast the seaborne flow of emigrants to Southeast Asia lay in Chinese hands. The official Qing attitude toward this human traffic, free or forced, was analogous to its attitude toward the opium trade. Many in authority deplored it; but no one took consistent action to stop it. Too many local officials found such activities personally profitable. Those who went to mine tin in Malaya, tough as it was, were more fortunate than those taken across the Pacific, either to shovel acrid bird dung, guano, prized as fertilizer, in a treeless environment on a desolate island off the coast of Peru with hot sun beating down all day, or to equally disagreeable toil on sugar plantations in Cuba. The tin miners in Malaya were often able to complete a work contract and then find something better to do. For them, Singapore served as a gathering spot, a free port for people as well as objects. Unlike so many other countries, Singapore welcomed immigrant Chinese, most of whom came as contract laborers who passed through the city to work in the nearby staple industries that were crying for labor. Those who stayed and failed to climb the economic ladder pulled the rickshaws, or carried sacks of rice on the docks, working a long day in the tropical heat. Immigrants were overwhelmingly male until the twentieth century. When females began to come in number after 1918 and the Great War, family life could begin, transforming the immigrant community. Indigenous Hawaiians, who crewed transpacific ships, had been settling the Vancouver and Victoria areas since the 1780s, jumping ship to take jobs in the burgeoning fur and later mining and timber industries; in the 19th century, they were recruited and imported by the Hudson’s Bay Company. In the 1830s, Hawaiian Canadians were the single most populous ethnic group employed by the company on the West Coast. By 1851, half the working-age population in Fort Victoria was native Hawaiian. By 1867, according to Tom Koppel’s history of their community, the Hawaiians had become farmers, landowners and fishermen, and were known, sometimes derisively, as “Kanaka” (the Pacific Island word for “man”). There was a substantial “Kanaka Row” shack town in Victoria, and sizable districts in Vancouver and on Salt Spring Island. They had their own schools and preachers, and while they taught their children English, some subscribed to Hawaiian-language newspapers…. Unlike the large populations of Chinese, Japanese and Sikhs who’d settle in the late 19th century and the first decade of the 20th, the Kanaka weren’t subject to exclusionary laws, race riots and the restrictive white-nationalist politics that defined Canadian citizenship policy during most of the country’s first century…. Canada is defined even more by the diasporas it creates elsewhere – after all, there is nothing more Canadian than being forced to leave Canada to succeed. Nowhere is this more evident than on the southeast coast of New South Wales, Australia, where an influential Canadian immigrant community reshaped reality in the middle of the 19th century. The Canadians were not voluntary immigrants. They were political dissidents, 58 francophones and 82 English-speakers, well-educated and influential men who were convicted of fighting for democracy, public education and free trade in the 1837 rebellions. They avoided the executions and dismemberments meted out to others, and instead were shipped to the Australian prison colony aboard the HMS Buffalo. There, the Canadians proved popular. The Bishop of Sydney sympathized with them and assigned many to serve as free labourers in Sydney, where they played a significant role in building the community physically and politically. Their presence is remembered in the names of Canada Bay, today a major suburb of Sydney, and nearby Exile Bay. And, according to Australian historian Tony Moore, they also proved politically influential, helping advance the causes of labour rights and governance (which, as a result of their defeat in the rebellions, lagged behind in Canada). Most were eventually freed and returned (though some stayed and started families), but their exile cost Canada many of its best minds. Everyone knows that the turtle beat the hare and the lesson that is to be learned by it. But when the American ship Sorcery (mahou [魔法] or majutsu [魔術] in Japanese) came across the finish line here at Expo the other day, it had to wait almost a week to see if it won the Hawai‘i–Expo Okinawa race. The likely winner will be the last to cross the tape, the Japanese entry, Musou. I asked how to say ‘finish line’ in Japanese and got the answer, gooru [ゴオル], from our English goal. To ‘breast the tape, or reach the winning post’ is, interestingly enough, gooru-in suru. Another use of this phrase is when one says, medetaku gooru-in suru, or more completely, medetaku kekkon ni gooru-in suru [めでたく結婚にゴオルインする], meaning to ‘be happily married’. Actually, the word kesshouten [決勝点] ‘decide-win-point’, is the trueblood Japanese word. The good ship Musou ([夢想] ‘daydream, vision’) will win, if it does, because of a healthy handicap: in Japanese furi na tachiba ni aru ([不利な立場にある] ‘be at a disadvantage’) allowing it to come five days later than Majutsu and still win. One of the small one-manned racing yachts is missing, the captain being famous Kenichi Horie, who, I am told, first crossed the Pacific alone in a yacht such as this. “Hajimete oudan shita” my friend said, the oudan [横断] meaning ‘crossing’ and being used in such delightful expressions as ‘jaywalking’, which the Japanese render quite longwindedly as douro o naname ni oudan suru [道路を斜めに横断する], literally, ‘road+ diagonally+ traverse’. An oudan hodou [横断歩道] is a ‘crosswalk’. And like all good Boy Scouts should know, ‘to help an old lady across the street’ is roofujin o annai shite douro o oudan saseru [老婦人を案内して道路を横断する]. Anyway, one of the members of the U.S. crew aboard the Majutsu wanted to know if there was a place to get a tattoo ([入れ墨] irezumi). The last two syllables sumi (z=s) mean ‘India ink, ink stick, ink (of a squid)’. Sumie [墨絵] is ‘black and white drawing, or India ink drawing’, and sumizome no koromo [墨染の衣] means ‘black robe of a priest’, literally, ‘ink-dyed clothes’. She was told that only the dregs of society get tattoos and that there was no place in Okinawa to get one. Yet on further inquiry, I found that several of the older women of two generations or more past had tattoos, and these very often conspicuously on their fingers or back of hands. Mr. Pogue, who runs the U.S. concession here, then said that about 70 years or so ago, when the mainland Japanese came down to raid and rule the island people here, they often took off many of the young girls to the cities in Japan, as maids, prostitutes, or whatever. But some of the Okinawans quickly made use of the mainlanders’ aesthetic aversion to visible (or any) tattooing, and colored up the hands of their beloved daughters with sumi. There are many euphemisms for prostitution in Japanese, it being an old profession there as elsewhere. Especially prevalent are compounds with ‘sell’ in the first position, e.g., ‘sell-spring’ ([売春] baishun), ‘sell-color’ ([売色] baishoku), ‘sell-laughter’ ([売笑] baishou), ‘sell-lewdness’ ([売淫] baiin), and so on. The last baiin is usually followed the suffix for ‘woman’, fu [婦], and all the others can be followed by fu as well. Filed under Hawai'i, Japan, language, U.S.
On our recent Overland Trail roadtrip through Oregon, Idaho, and other northwest states, the Far Outliers encountered more than a few unusual names. Here are three of them. Minidoka is a Dakota Sioux word that means ‘water-spring’. The same root meaning ‘water’ occurs in the names Minnesota, Minnetonka, and other places where the Dakota Sioux once roamed. It occurs in several placenames in Idaho, including the name of Minidoka County, the eastern neighbor of Jerome County in south central Idaho. On our way through Jerome County, we got off the Interstate to visit the Minidoka National Historic Site. 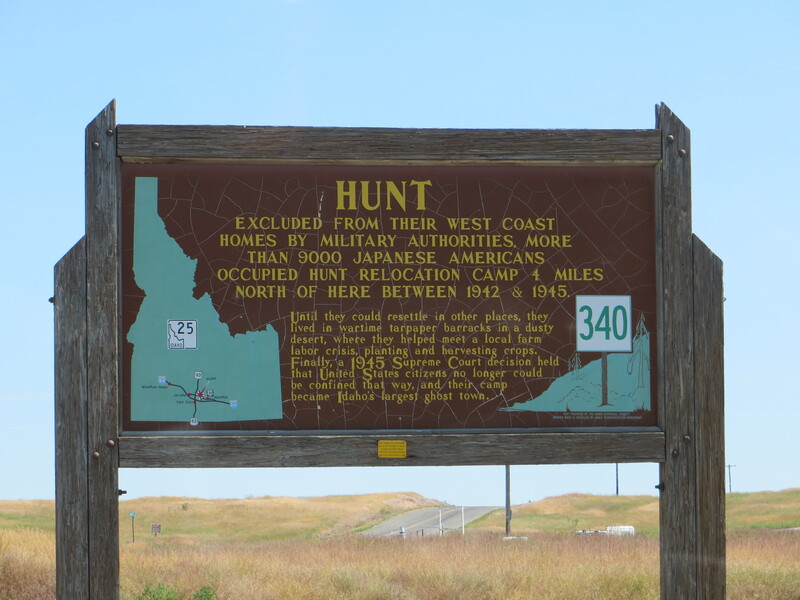 In 1942, nearly 10,000 people of Japanese ancestry were evacuated from Alaska, Washington, and Oregon and interned in Jerome County at a place locally known as Hunt. The historic marker (above) that directed us to the camp did not call it “Minidoka” but did mention Japanese internment. The internment camp built in Jerome County was soon renamed for neighboring Minidoka County to distinguish it from another Japanese internment camp in Jerome, Arkansas. There is lots of new signage within the Idaho site now, but only the one historic marker to help strangers find their way there. Owyhee is an old rendering of what is now spelled Hawai‘i, the name of the largest island in the Hawaiian archipelago. How did it come to name so many features of the region where Oregon, Idaho, and Nevada come together? According to the Owyhee County Museum in tiny Murphy, Idaho, the name honors several Hawaiian fur trappers who worked for the North West Company of fur trader Donald MacKenzie, who explored the area between 1818 and 1821. The Hawaiians disappeared, but an echo of their homeland graces Idaho’s first incorporated (and second largest) county, as well as a city, a desert, a mountain range, a river, a lake, and a dam far into the interior of the Pacific Northwest. Spudnik is a cutesy name for many different things. A few of them even have something to do with potatoes. In the quirky but informative—and sometimes corny—Potato Museum in Blackfoot, Idaho (the “Potato Capital of the World”), we saw an early model of a potato-scooping machine invented by local potato farmers Carl and Leo Hobbs about the time the first Sputnik was launched in 1958. They decided to market their new line of potato harvesting equipment under the name Spudnik. Now they sell the largest-scale potato planting and harvesting equipment in North America. Filed under Hawai'i, Japan, language, travel, U.S.
Honolulu resident John Bond, who has done a lot of historical research on the Ewa area of Oahu, has posted on the Ewa Battlefield blog a long compilation of his findings about a top secret World War II POW camp near Iroquois Point. Here are a few excerpts. Camp Iroquois was unique as a Japanese POW camp with a philosophy of winning the “hearts and minds” which helped play a significant classified, secret role in winning the Pacific War. Americans usually heard very grim and brutal stories of the treatment of American prisoners in the hands of the Imperial Japanese military. Japanese military POW’s arriving from the Pacific island battlefields were relatively few in numbers due to the fact that they were expected to never allow themselves to be captured alive. Huge numbers killed themselves by suicide attacks or killing each other. Those that were captured early in the war usually were the result of incapacitating wounds or ship being sunk, such as at the battle of Midway where the Imperial Japanese Navy lost four aircraft carriers, among other fleet ships. Those survivors that could be picked up were brought back to Pearl Harbor to be interrogated for their military knowledge. Then they were screened for a possible interest in cooperating with the United States to win the war by saving Japanese lives and preparing for the future democratic government of Japan. Additionally, the alumni of the Camp Iroquois project became some of the most important ambassadors, academics and writers that greatly influenced future American Japanese relations and the establishment of many organizations developing diplomatic and cultural relationships and a solid mutual defense partnership…. Camp Iroquois really should be a part of the telling of the Honouliuli Internment and POW Camp story. Fortunately a lot of the story has actually been saved in great detail by the US Navy Japanese/Oriental Language School Archival Project, University of Colorado at Boulder Libraries in newsletters called The Interpreter. Approximately 2,700 Korean POWs were captured and brought to the Island of Oahu, where they were incarcerated until the end of the war and their repatriation to Korea in December 1945…. Plucked mostly from various Pacific islands toward the end of the war, these Korean POWs were detained in a camp in Honouliuli on the Island of Oahu. This camp, located in Honouliuli Gulch, west of Waipahu, was opened in March 1943 as the Honouliuli Internment Camp to detain Japanese and Japanese-American internees as well as POWs from Japan, Italy, and elsewhere. It was later renamed as Alien Internment Camp and still later as POW Compound Number 6…. Among the 798 men on the Japanese side on Makin Atoll, there was one labor unit consisting of 276 men “who had no combat training and were not assigned weapons or a battle station,” according to one report. It is believed that most, if not all of them, were Korean. If this is true, out of 276 Korean noncombatants, only 104, less than half, survived as prisoners while 172 died in the fighting. The Gilbert Islands Operation then turned against Tarawa Atoll, where more than 4,700 defenders, including 1,200 Korean laborers, were stationed.8 After four days of fierce combat, the atoll was brought under American control. The total Japanese and Korean casualties were reported to be 4,713. The only survivors were one Japanese officer, 16 enlisted men, and 129 Koreans who were taken as POWs. This means that out of 1,200 Korean noncombatant laborers on Tarawa, only 129 survived as POWs and nearly 1,000 died in battle…. In addition to these Korean POWs from the Gilbert Islands, some 300 to 400 Korean laborers were brought to the Honouliuli camp after the American military operation on Saipan in 1944. In a telephone interview I conducted with Mr. Young Taik Chun, a second generation Korean-American, on October 27, 1990, he stated that in July or August of 1944 the United States military authorities asked him to interpret for Korean POWs at the Honoulilui camp, who had just been brought from Saipan. When he arrived at the camp, there were 300 to 400 Koreans, all of them noncombatant laborers, who had recently been transported from Saipan…. It is likely that Korean laborers from various other Pacific islands, such as Guam, Tinian, Palau, and Peleliu were also brought to the Honouliuli camp as POWs, having experienced similar ordeals…. A United States military report, dated July 28, 1945, states that 2,592 Koreans were detained in Hawaii…. This number increased to 2,700 by December 1945 when a complete list of the Korean POWs of the Honouliuli camp was made just before they were repatriated to Korea. There were also three Korean college student draftees (Ko. hakbyŏng, Jp. gakuhei) who deserted and surrendered to the British in Burma (a fascinating story), and three fisherman abducted in April 1945 by an American submarine, Tirante, in the strait between Japan and Korea. From “Events in Hawaii,” by F. S. Scudder, in The Christian Movement in the Japanese Empire, including Korea and Formosa, a Year Book for 1915 (Conference of Federated Missions, Japan, 1915), pp. 333-336. Interchanges – Our geographic situation has furnished us, as usual, special opportunities of brotherly service. In May, 1914, the visit of the training ships Asama and Azuma gave many Americans the privilege of becoming acquainted with Rear-Admiral Kuroi, whose noble character won the admiration of ail who met him. It was a happy coincidence that while a party of prominent citizens of Hawaii were touring Japan and daily receiving the highest courtesies in that Land of the Rising Sun, we of the setting sun should have the opportunity of offering the first welcome to these men of the Japanese navy on their visit to various American ports. A band of thirty young men, wearing a “Y” on their sleeves, and representing the Japanese Y.M.C.A. tendered their services as guides throughout the city and vicinity of Honolulu. An international welcome service was held both in Honolulu and Hilo, in each of which no less than 1,000 people gathered. At the Honolulu service, the picture of Admiral Kuroi, seated between Governor Pink­ham and Admiral Moore, and in the midst of a group of fifteen other prominent citizens of Honolulu, was one that called out from many the remark, “How could those two Admirals ever be conceived as being ranged on different sides in a conflict.” Such services certainly tend to bind us together in sympathy, respect and mutual interest. Peace Scholarship Students – Another incident evoking interesting comment was the coming of three more Peace Scholars from Japan to the Mid-Pacific Institute. That the sending these three boys should have been deemed of sufficient importance to draw together at the home of the Prime Minister of Japan a number of the leaders of great movements in that Empire, shows the remarkable way in which the master minds of Japan foster, from its tiniest beginnings, the ideal of world peace. No account of the year’s activities would be complete, without mention of the definite efforts put forth to bring about mutual understanding between the people of America and Japan. Central Union Church gave its minister, Rev. Doremus Scudder, D.D., leave of absence for three months, to join with Rev. S. L. Gulick, D.D., in a campaign of good-will in the United States. The results of this campaign, though of far-reaching impor­tance, are not yet made public. This was followed by the visit of Doctors Mathews and Gulick on their way to and from Japan, and on his return trip, Dr. Gulick made a tour of these Islands, investigating the condition of the Japanese here and the estimate put upon them by the people of Hawaii. Dr. Gulick’s report of this investigation will prove of intense interest and value. Rev. S. Kimura made a three months’ evangelistic campaign in the Islands, deeply stirring the Churches of all nationalities, and giving a strong forward impetus to the work among the Japanese. Young Japan in Hawaii – One of the big problems of missions in the ever-changing condition of Hawaii is that presented by the changing language of the people. Looking at this from the Japanese side alone, it is of serious proportions, as will be noticed from the following considerations, but what is here said in reference to the Japanese is likewise applicable to the youth of all other nationalities growing up in our midst. Here in a nutshell we have a problem which may be outlined as follows: Since the immigration of Japanese, excepting of brides, is practically discontinued, the increase of the Japanese population must henceforth be chiefly of those born in the Islands–who are educated in the public schools and whose knowledge of the Japanese tongue, after they are eight or ten years of age, becomes less and less, while English becomes their favourite language. By the time they are old enough to attend church services we are in danger of losing all influence over them, for on the one hand, their knowledge of Japanese is so limited that they can not understand the sermons preached by Japanese ministers, and on the other hand, even our best qualified Japanese ministers are not equal to preaching in English acceptably to those youths who have attended our public schools, and acquired English through play and study from their childhood days. Buildings Ready – Church buildings are already available, each nationality being fairly well provided with suitable buildings, but unless these Churches are quick to adapt themselves to the changing order, they will soon be ministering to a small body of old people, while the great body of our young people will be unshepherded. Need of Dual Ministry – It is evident then, that while utilizing the present church buildings as permanent centres of rel1g1ous life we must have a bi-lingual ministry if we aim to reach both the old and the young, and as the difficulties in the way of securing one man who will speak the two languages are practically insuperable, we must begin as rapidly as possible to provide each of these Churches with an associate minister, of its own national type, who shall take charge of the English work. Question of Expense – The sooner the problem is faced, however, the less the expense involved. By beginning at once to adapt ourselves to it, placing in the field one new man at a time and locating him at a strategic centre, the initial expense would be moderate, and the help thus given would so strengthen the Churches that they would move more rapidly towards self-support, thus keeping down the annual increase to a reasonable sum.